Carry your quarters and gaming accessories in this fun messenger with a design that mimics the retro game kiosks of the good old days! Details include faux coin slots and authentic cabinet art. Made from durable polyester, the bag features a unique "screenshot" top flap and a padded laptop sleeve that fits most 15-inch laptops. The spacious main compartment has interior organization pockets and there's also a back exterior pocket. The custom interior lining is based on the classic Midway Defender arcade game. 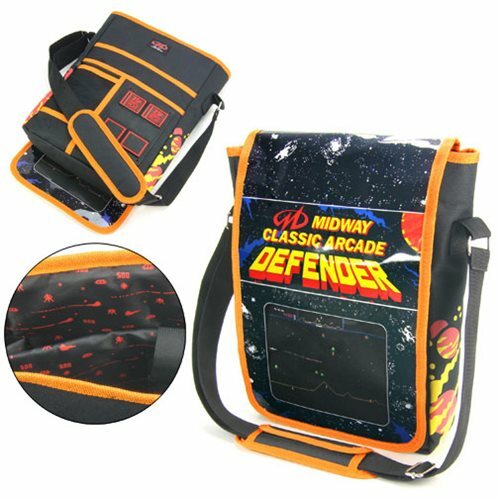 Complete with a padded shoulder strap, the Midway Arcade Defender Messenger Bag measures approximately 10-inches wide x 14 1/2-inches tall x 3-inches long. Ages 15 and up.